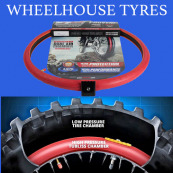 Tubliss is a tubeless system for motocross and enduro competition. It employs a Dual Pressure Chamber system that replaces the conventional tubes with a high pressure rim protecting inner bladder that acts as a 360° rim lock that seals the tyre around the circumference of the rim. 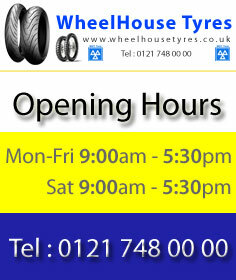 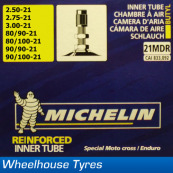 This system allows much lower pressures to be run in the tyre than using an inner tube giving an increase in traction. The inner bladder is inflated to 100psi locking the tyre to the rim and also acting as a rim protector. The outer chamber can be ran from 0 psi upwards depending on the ground conditions, this system also allows you to quickly fix punctures with a plug. 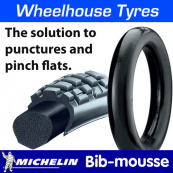 The Tubliss system is lighter than a good quality inner tube so as well as gaining traction they also save weight in most cases. Michelin Bib Mousse Puncture Proof Competition Foam Inner Tube. 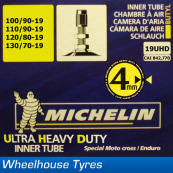 Originally designed and developed for the Dakar rally, the Michelin Bib Mousse has become renown worldwide as the ultimate in flat prevention. 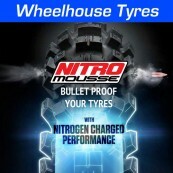 Perfect for Enduro, Rally, or Motocross, the Bib Mousse tubes provide not only piece of mind during the race or trail ride but also outstanding traction and handling. 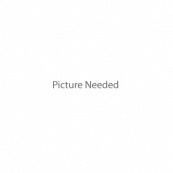 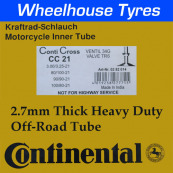 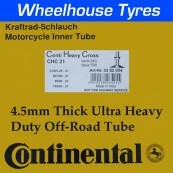 Continental Tubes CC21 2.7mm Heavy Duty MX/Enduro Tube All 21"
Continental Tubes CHC21 4.5mm Ultra Heavy Duty MX/Enduro 21"